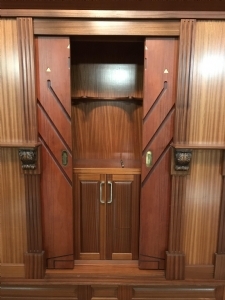 Help Bring New Torahs to our Shul! As many of you have already heard, on January 20, 2018 Saturday night, after Shabbos, someone came into our Chabad House and stole two Sifrei Torah - Torah scrolls – from the Aron Kodesh (Holy Ark). We cannot describe the shock, horror and disbelief upon opening up the Ark Sunday morning and find our Torah scrolls missing. We never thought that this could happen in our island paradise. When word got out to the local community and friends worldwide – the reaction was the same: disbelief, dismay, sadness – and great pain for the well-being of the Torah scrolls. People of good will, of all faiths, are stunned and have come forward to express their support. There can be no greater loss than the disappearance of these Torah scrolls! The Torah is the life and heartbeat of the Jewish people! It is the most sacred object in Jewish life! 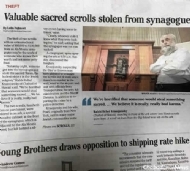 While a major effort is underway to find the lost Torahs, many friends have come forward to urge us to replace these scrolls. We turn to you, our friends, to help us restore two Sifrei Torah to our shul! “Torah Or” - The Torah is Light! The Torah brings G‑d’s light to our lives, inspires us, guides us throughout the millennia of our people’s existence. Let us respond to this terrible act of darkness by, each and every one of us, bringing G‑d’s light into this world. Let us increase our commitment to Torah, our study of Torah, our observance of Torah…! “Me’at or docheh harbay choshech” - "A little light dispels a lot of darkness” The Zohar. At the urging of friends and supporters, we are initiating a project of writing 2 new Torah scrolls - statewide! The plan is to commission new Torahs to be handwritten - leaving some letters at the end to be written in every island, creating HAWAII UNITY TORAHS! There are 304,805 letters in a Torah: “Own” a letter, a verse, a chapter, a Book of the Torah today! Suggested donations are in increments of 18 = CHAI = LIFE! Or donate any amount of your choice – and help restore 2 Torahs to our shul. TO BE A PART OF THE "HAWAII UNITY TORAHS" & HAVE A LETTER, VERSE, CHAPTER INSCRIBED FOR YOU, please click here or go to chabadofhawaii.donorzen.com. May this act of Tzedaka (charity) and kindness bring light into your life and the life of your loved ones! Article in Honolulu Star Advertiser Wed. Jan. 24, 2018: click here. Some media coverage of the theft: click here.